Honestly, A MONKEY STOLE MY HOTDOG! 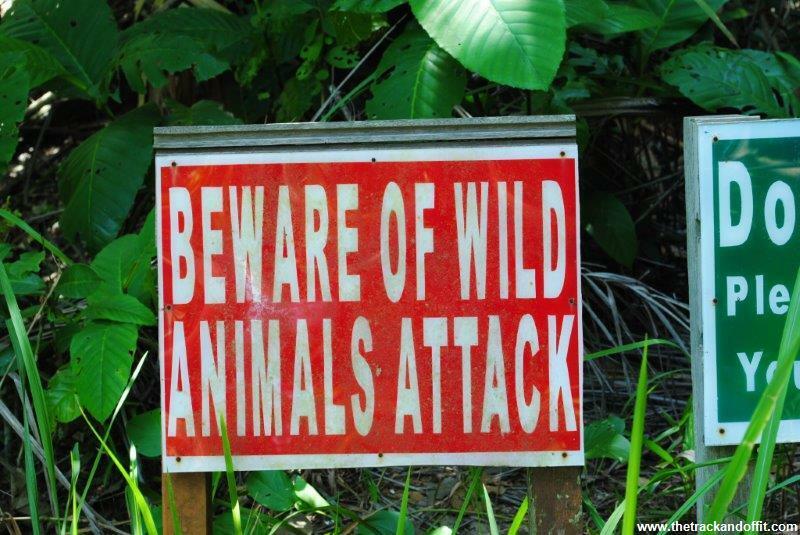 People should really pay attention to those signs about wild animals attack. The animals are out in force before breakfast. 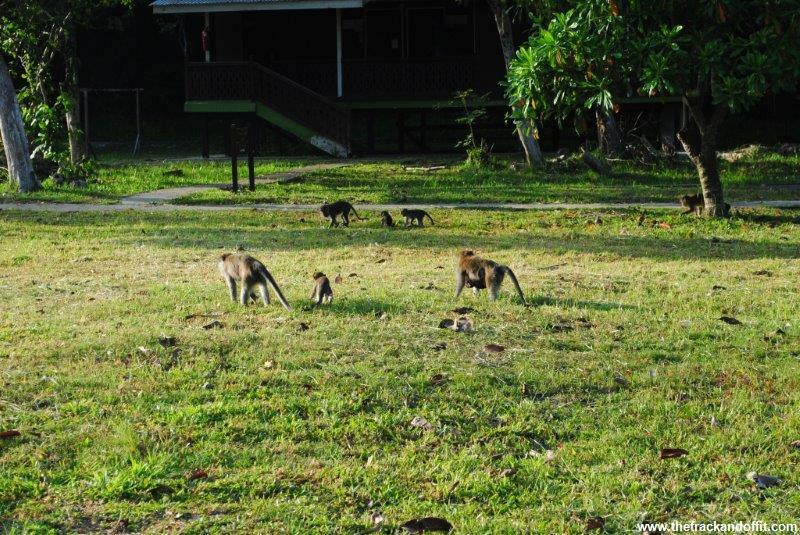 Hundreds of long tailed macaques roam amongst the trees near park HQ, eating fruit from the grounds, the trees, wherever is easiest. Okay, maybe not hundreds but certainly a lot. 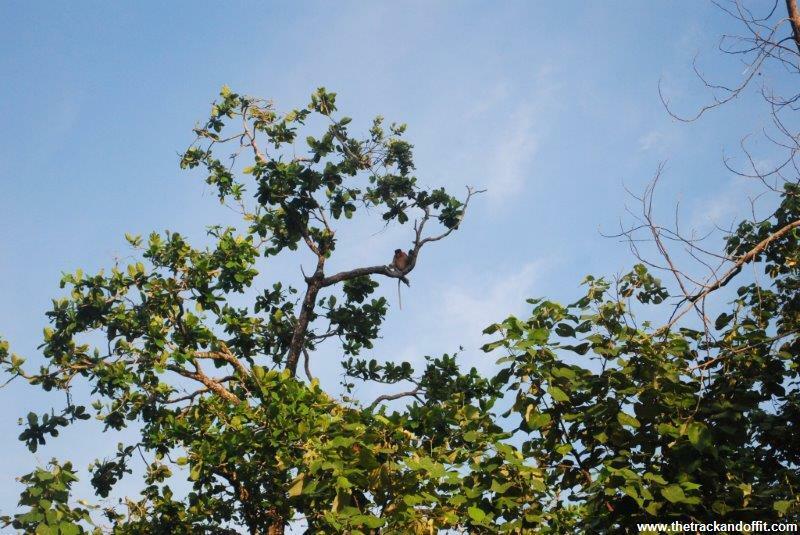 Everywhere I turn there’s another monkey creeping from around a tree. The macaques seem to be used to people and I suspect the easiest way to get food is to get close to the humans. They’re bold. Even the babies. 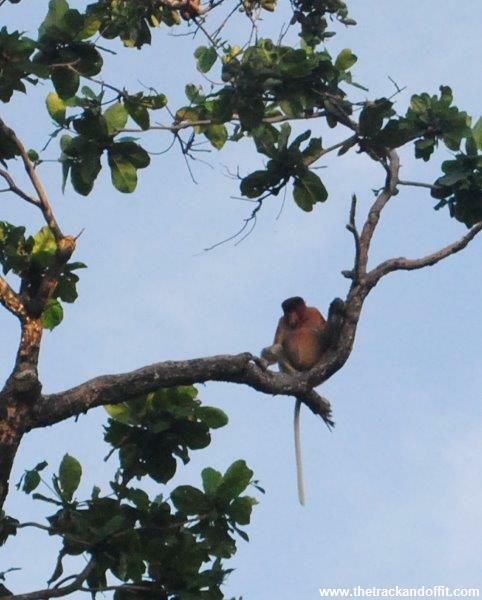 The proboscis monkeys are shy though, staying high up in the trees, eating leaves. Their funny shaped bodies are quite enchanting. George, Tom and I watch them eating their breakfast of leaves and fruit, then head to HQ to get ours. It’s warm so we avoid the stuffy indoor restaurant and find an empty table on the verandah to eat breakfast while we enjoy nature. The guys keep watch while I get my plate first. There’s not much choice if you’re trying to be healthy. I get chapatti, vegies and, of course, a hot dog. I rejoin the boys and sit down. The boys head to the buffet. I take a bite of my hot dog. It’s pretty good. A sip of water. A bold macaque comes up the steps. This is not unusual, I saw them do it yesterday. I look around for the ranger with the rake who should scare them off but he’s nowhere to be seen this morning. The monkey eyes me back. He creeps forward. I take another bite. He moves closer. 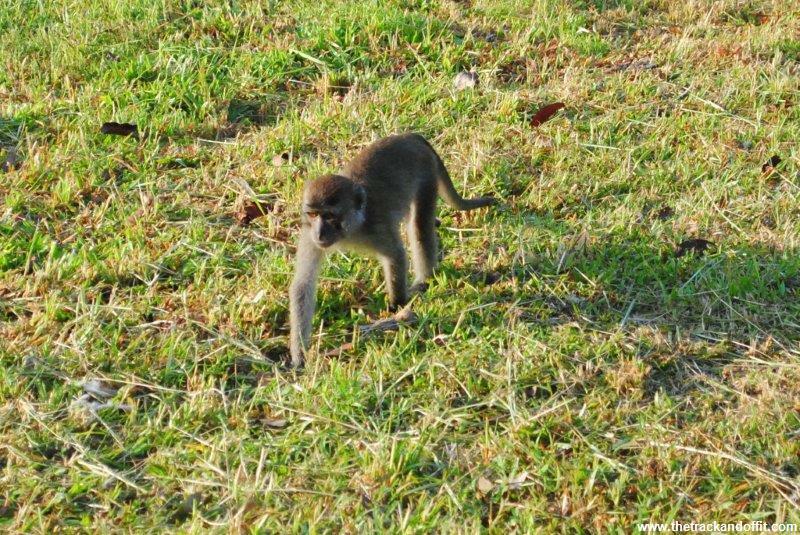 I remember the signs about wild animals attack and the disease that monkeys carry. I don’t want to get in a fight with this creature, even if I’m four times it’s size. I stand up. The monkey leaps on the table, I leap back, my chair clatters to the floor. The cheeky macaque reaches out a small monkey hand… AND SWIPES MY HOTDOG! He then leaps back in fear of retaliation, stuffing MY hotdog in his cheeks. The whole thing lasted mere seconds. I grab my plate, water bottle and our bags and scurry off indoors of the restaurant and slam the door to keep out any other bold breakfast thieves. Two other groups also beat a hasty retreat, though their breakfasts are intact. Good preventative action. The park ranger comes along and shoos a few monkeys away from the restaurant. Inside the boys join me at our new table, puzzled as to why we are now inside. They were completely oblivious to my stand off with the macaque. When I tell them, they wished they’d seen it – the adult human female, scared of a young macaque, falling all over herself to get away from a hotdog thief. I wish I could have seen it too. Don’t eat hotdogs in the jungle. Beware of wild animals attack. We have problems with cheeky monkeys here too in Singapore. The girls were very excited to hear of your close encounter. Did you manage to get a photo of monkey with the hotdog? How I wish I had! It all happened so fast and I’d packed my camera away to have breakfast. Next time I’ll know better and keep the camera ready to point and shoot any thieving monkeys!